Come on in!! No, don’t worry about taking off your shoes…just put your stuff on that table over there and grab a drink! Angie brought her delicious Latin Lover – the drink of course! We will be pouring those all night long and since this is a blog party, nobody has to worry about driving home – so you can have as many as you want! I am so excited about being a co-hostess with Hilda this week at Fiesta Friday! Now I know that Angie said we didn’t have to worry about doing any extra cleaning or decorating. But being an over-functioning hostess, I have been cleaning all week! Phew, I’m sure glad that Friday is here at last. Now I can relax and enjoy your very fine company. So, Hilda, Angie – let’s get to it! Who’s pouring? OK! I will! I love to cook with spices and am constantly fascinated at how a quick tweak in a few spice blends can completely change the flavour and character of a dish. Take some simple ingredients such as rice, beans and tomatoes. Add chili powder and cumin and it tastes like Mexico. Add some cinnamon, cumin and ginger and it becomes Middle Eastern. Or take cumin, coriander and garam masala and now we have Indian. The possibilities are infinite and we could explore them for a lifetime and still discover new combinations. Recently I took some classes on Moroccan cooking. During the first class, the chef brought out her little box of precious saffron. As she simmered the heavenly concoction she asked us if we could smell the saffron. This gave me pause – it dawned on me that I had never really smelled saffron in my own kitchen! Well, what the heck is wrong with me?? In the past when a recipe called for saffron, my eyes just glided over that ingredient, right on to the next one! Oh what a fool I have been! I guess that the price has just scared me away and I couldn’t see how the added cost could make an appreciable difference to the taste of the food – wrong! Well, now my friends, you are going to see a number of recipes on my blog, with saffron, because I can’t get enough of this intoxicating spice. I know it is the most expensive spice on the planet, but hey, it takes 200,000 crocus flowers to produce just 1 kilo of saffron! I think the price just might be justified! I made this salad last weekend and my husband and I quickly polished it off! Good sign – the Fiesta Friday gang will enjoy it too! So I whipped up a fresh batch for all of you, my Fiesta Friday buddies! And for any of you reading this who haven’t heard of FF, you really must check out our host Angie’s blog: The Novice Gardener. Every Friday she hosts a virtually wild blog party. Check it out!! This recipe is adapted from “Whitewater Cooks at Home” by Shelley Adams. Heat the port in a little pot and add the figs. Let simmer for about 5 – 10 minutes until tender and drunk! They will absorb all of the port. Set aside. Melt the butter in a large skillet and sauté onion until golden brown. Add the garlic, cinnamon, cumin and cardamom and sauté until fragrant. Remove from heat and set aside. Put the quinoa in a saucepan and add the chicken stock and saffron. Bring to a boil. Reduce heat to low. Cover and simmer for 10 minutes. Turn heat off and leave saucepan on the element for 5 minutes. Remove from the element and fluff with a fork. Spread quinoa on a cookie sheet to cool. Place the cooled quinoa in a large bowl and stir in the onion, spice mixture, red peppers, oranges, figs, herbs and salt and pepper. Whisk together the ingredients for the vinaigrette in a small bowl. Just before serving, sprinkle the salad with some of the vinaigrette. You will probably want to reserve some, depending on how moist your salad is. I find that the next day the salad is a bit drier and you may want to add more vinaigrette at that time. Garnish with pistachios and sprigs of mint. Julianna, that is one beautiful salad! Thanks so much Hilda!! Too much fun to be co-hosting with you!! I didn’t’ know that you were Canadian too! By the way Angie told us to keep an eye on Victoria and Justine. Apparently they have a thing for Angie’s Latin Lover! It is fun. Didn’t the maple syrup give it away that I was a fellow Canadian? You know it’s going to be a hoot! Are you joining us at FF? Oh, it is such an honour to co-host for Angie!! She has organized such an awesome party for us, don’t you think? What a great combination of flavors! Love the figs – what a sweet addition to a salad! Looks so hearty. I love salads like yours that are filled with interesting textures and flavors. Thanks so much for your lovely comment, Lisa! Yes, I am really into those big salads with lots going on! Every bite is interesting! This salad looks amazing and sounds absolutely delicious. Port soaked figs? Mmm… sounds perfect! And a big “Thank You” for taking on the co-hosting duties with Hilda this week! Wow! Amazing colors! If it tastes half as good as it looks, it must be to die for! wow, so many herbs and spices. awesome! I love the idea of these drunken figs! Gorgeous! Looks like such a great meal! How beautiful. It looks like jewels! Sounds so good Julianna! I love quinoa, and all these flavors….wow! I know, I think the sky is the limit with this wonderful, healthy grain! Hey Lori! Happy Fiesta Friday! 😀 Are you having a good time?? Another Latin Lover? Julianna! What a beautiful salad–so earthy and healthy! I love quinoa and eat it at least twice a week now, breakfast, lunch or dinner! Always looking for new ways to incorporate it into my meals. I will definitely go back for seconds (if you don’t mind)–since you know, I’ve had one too many of Angie’s Latin Lovers already and need something to soak it all up. Phew! And every time I turn around there is something new on the table to nibble! Amazing huh 😀 Have a great week, Noony! I am guilty as charged on the account of skipping saffron like you, Julianna. Now, you told me, I shall buy a pack! Thank you for the recipe! Oh, I think many of us have been skipping it! But it really makes such a lovely difference! Oh My God! So many herbs ! Looks absolutely divine ! Well, thanks so much! I’m glad you think so! 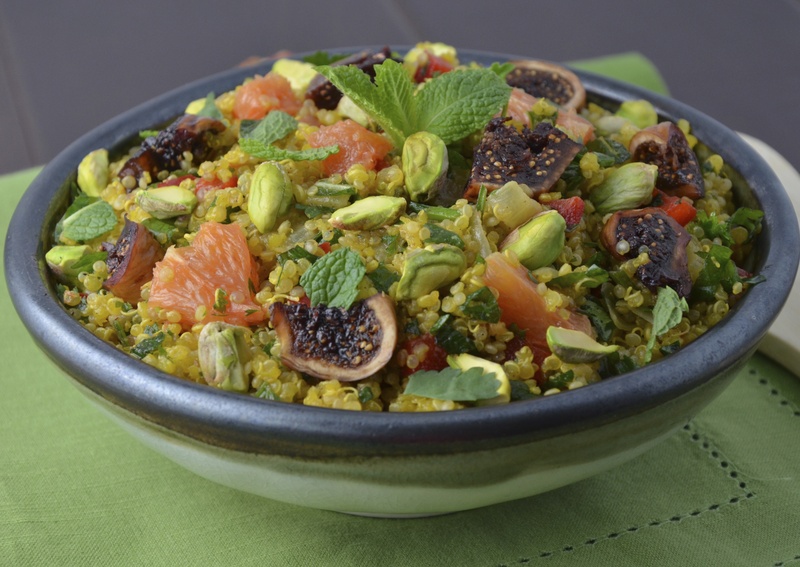 Drunken figs, saffron and pistachios… this is one flavorful salad! What a gorgeous salad, Julianna! It’s a work of art! Oh Patty, you are too kind! yummmm-o!!! this looks and sounds amazing. you just made me very hungry Julianna!!!! So many delicious flavors! This sounds unique, filling and really special! Thanks so much, Laura! It is really special…and gluten free! Are you interested in joining us over at Fiesta Friday? There are always some awesome gluten free dishes and of course so many interesting bloggers to chat with! Check it out, it would be nice if you joined us! This salad looks pretty and colorful and sounds delicious. I am just making my way around to try some. I think I was at the drink table to long! Haha j/k! 😉 But doesn’t everything look delish! Thanks for sharing this wonderful salad and for co-hosting! That must be the most healthy salad I’ve seen this year! Thanks for all your effort on our account; a lovely co-host indeed. I am a big fan of figs, dried, drunken, fresh…love them all. Looks great. First of all congratulations on co hosting the fiesta # 10 with Angie. How exciting and all the best for hosting a mix of party people here ;). And finally, what a gorgeous salad you have brought to the tabes this party. 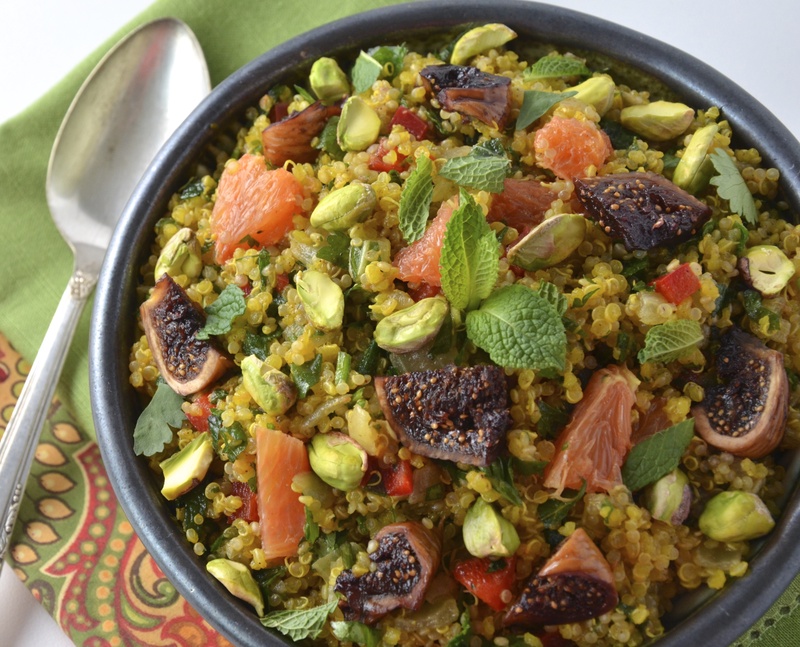 Drinker figs, saffron, quinoa and pistachios in I combination of few wither ingredients…a wholesome, aromatic and a soulful dish. 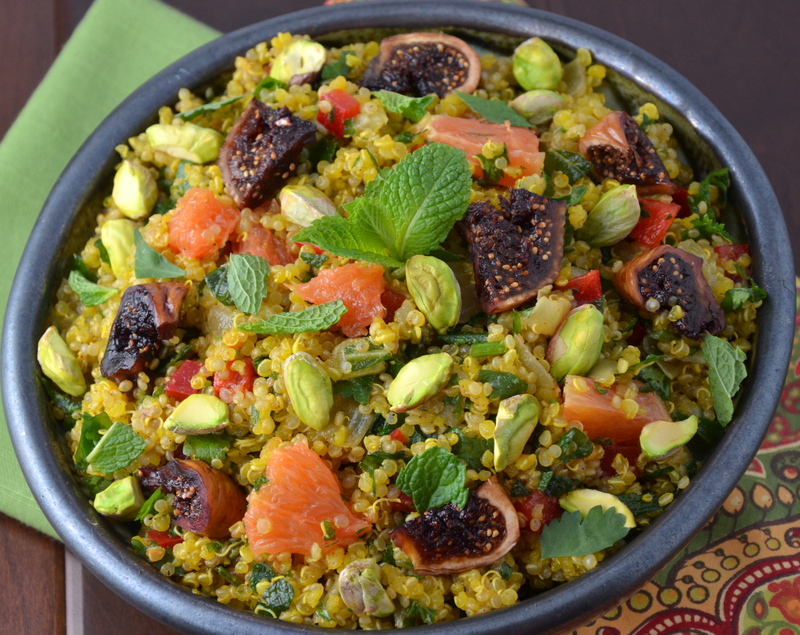 I am just imagining the flavor of saffron and quinoa together….what a warm combination! Yuuuuuuuum! That’s a delish and healthy dish to bring to fiesta friday! Thank you! It’s looks absolutely scrumptious! LOL! Yes, and I am having so much fun too! The more I get to know the Fiesta Friday gang, the more I like these guys – and we only have Angie to thank for all of this – can you hear me Angie? (I think I see her over at the drink table again hanging out with the Latin Lover that she brought 😎 ) Angie – we love Fiesta Friday and you are so awesome for organizing this for us!! Julianna, you are a perfect co-host. You and Hilda both! So, don’t be surprised if I ask you two to do another round in the future, maybe even with more duties added. Scared? Hahaha… Don’t worry, only when you’re ready. The salad, by the way, is just too fabulous for words! How in the world did you come up with such a recipe? I read the ingredients and I just knew instantly this would be a great dish to serve at a party. Just. So. Special. Ahhhh, I’m really scared 😥 Can’t find an emoticon for horror, so that’s me crying ! 🙂 Actually, it has been a lot of fun! I think I mentioned that I love to party, so being a co-host for your Fiesta has been a hoot and it has been a perfect pleasure to co-host with my Canadian buddy, Hilda! She is so smooth and gracious and I loved sharing bar duties with her – she kept my drink topped up all night long 😎 So you just have to say the word, and I’m sure we would love to do it again, eh Hilda? Glad you liked my salad with drunken figs! I thought the guests would appreciate it and I think they did! Thanks again Angie for asking Hilda and I to co-host! It has honestly been an honour and all of us at Fiesta Friday are so thrilled that you have set up this party atmosphere where we can mix and mingle and be silly and share what each of us loves best, be it recipes, photos, poetry or stories. You are awesome! Julianna..your excitement is so contagious!! And..I could feel myself feeling happy while I was reading this post…. your salad is superb… drunken figs? Just fabulous!! I must try this very soon! 🙂 So exciting to have you and Hilda co-host with Angie!! So glad you like the salad, Prudy! Oh yes, you really must try the drunken figs – really nummy 😉 I have to admit that I was thrilled when Angie asked me and Hilda to co-host! The Fiesta Friday gang is an amazingly talented and fun group to hang out with and this party has been so much fun! See you next week, huh? You’ve convinced me I need to make drunken figs!! Oh Erika, you don’t know what you’re missing! I just love this stuff. I have another recipe on my blog for Quinoa, Black Bean Salad! I have converted many quinoa initiates with that recipe! Check it out 😀 I hope you have a wonderful week! teeheehee… Drunken figs 😉 Yes, I would like to get some figs drunk. Can I just have the drunken figs please??? No wait, cause then I would miss out on the rest of this INCREDIBLE salad! I just love what you’ve done here! I too have been terribly guilty of always neglecting poor lil saffron, but you’ve inspired me to change that. Thou shalt not treat spices with favoritism just because thou art afraid. Equal love for all the spices!!! Hey Lina! Sure you can have just drunken figs – I won’t tell anyone 😎 ! And I will remember about not favouring some spices! I must admint that I have some very unloved spices in my spice drawer! Hope to see you again next week at Fiesta Friday! Haha me too! I was speaking to myself on that cooking commandment but I’m sure I’m not the only one… See you next week and thanks for being such a gracious host! Oh my, this looks amazing. I love figs, too! LOL! Yes, and most of the other FF’ers too! You had me at sweet port – hehe!